If you've been putting off that dental your cat needs, maybe you should drop everything and call the veterinary dentist right now. A new study confirms what vets have suspected for a long time: There's a link between dental and chronic kidney disease in cats. The study, reported by the Winn Feline Foundation, looked at 56,414 cats who had periodontal disease when their vet clinics enrolled them in the study. Researchers followed them for 11 years. 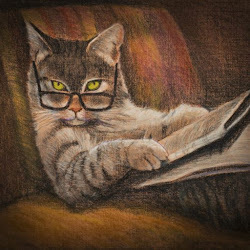 Which Cats Are Most At Risk Of Kidney Disease? In addition to the link between dental and kidney disease in cats, the researchers found older, spayed/neutered, female purebred cats were most likely to develop chronic kidney disease. Other risk factors included more dental cleanings than cats in a control group, recent anesthesia and FVRCP vaccinations. And it's not just the link between dental and kidney disease that causes concern. Cats with dental disease are more prone to heart disease, cystitis, diabetes, hypertension, hyperthyroidism and other health issues. "The authors conclude that breed, age and severity of dental disease are all risk factors for the development of chronic kidney disease in domestic cats," Wynn writes. "Purebreds are likely at increased risk compared to mixed breed cats, likely due to genetic influences." If nothing else, the study provides some talking points for you to bring up next time you see your vet. A couple of easy answers are to refuse those FVRCP vaccinations, because your cats don't need them anyway. And care for your cats' teeth as carefully as you care for your own. Brush you cats' teeth regularly. See if they'll eat dental treats and chews. And try to eliminate or cut way back on dry food. 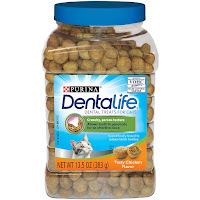 Cats don't actually chew dry food. They either swallow it whole or manage to splinter it with their teeth. When it splinters, it manages to work its way under the gums, causing dental disease. Raw meat is another way to keep your cats' teeth clean. Mine love big chunks of raw beef. They tear and shred them and eat the way cats' are designed to eat. 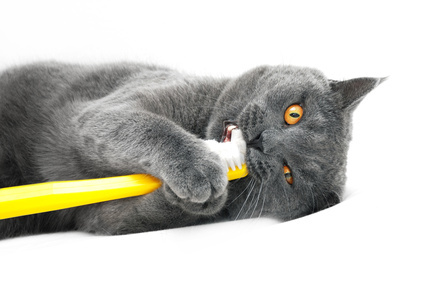 Here's a good video on brushing your cats' teeth. by the Veterinary Oral Health Council.